Indulge in a little treat with our Traditional Afternoon Tea at Park Grand London Lancaster Gate. With a selection of freshly made finger sandwiches, scones, macaroons, tartlets, muffins, cream doughnuts and, of course, a nice hot pot of tea from our range of assorted teas, you are sure to enjoy this mouth-watering experience. Embracing the quintessentially English tradition, with a contemporary twist, your tea experience can be taken to a whole new level of indulgence with our Chocolate Afternoon Tea. Served at the restaurant or hotel garden, indulge in freshly made finger sandwiches, chocolate scones, chocolate Swiss roll, chocolate muffins/ triple chocolate loaf bite, banana and walnut cake, macaroons and a nice hot pot of tea from our range of assorted teas. A traditional English afternoon tea get more luxurious when served with a chilled glass of champagne. It really is an experience every guest just must indulge in. For those special occasions why not spoil yourself by having the Champagne afternoon tea. Sugar spice and everything nice! Enjoy and afternoon tea inspired by the flavours of India at Park Grand Lancaster Gate. 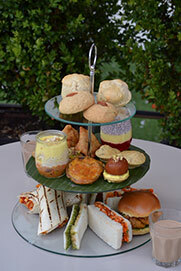 Our Indian inspired afternoon tea offers a selection of authentic Indian treats and assorted sandwiches with an Indian twist, Enjoy Mumbai's favourite tea time snack, the 'Bombay Aloo Bonda Pav' - a crisp spiced potato croquette with layers of sweet and spicy chutneys enveloped in soft traditional bread - 'Pav'. A unique presentation of sweet and savoury treats complimented with refreshing spiced tea is a new way to enjoy an Afternoon Tea. Tea choices also include a deliciously delicate Assam or Darjeeling tea. Two great English summer traditions, rolled into one al fresco treat! On our sun-dappled terrace this summer, classic cream tea with delicious, just-baked scones, clotted cream and strawberry jam, meets a medley of mini ice cream cones, colourful finger sandwiches and an ice cream sundae. Exquisitely presented and perfect for sunny afternoons, it also comes with pink champagne, should the fancy take you. Afternoon Tea will be served in the restaurant/garden. Available every day from 14:30pm to 5:30pm (24hr prior reservation is required). For more information or to make a booking please contact us on +44 (0) 20 7262 0111 or email dining@parkgrandlancastergate.co.uk.